The net return of the Trade Ideas’ simulated portfolio for Q1 2018 was 16% after commissions in Risk-On mode. These results were achieved by the company’s A.I.-powered investment discovery engine named ‘HOLLY.’ The portfolio’s gross return, before commissions and fees, measured 19%. These results compare to the S&P 500, measured by the $SPY index, which returned a loss of -1.0% over the same period. Risk-On performance reflects a bias towards staying in the positions beyond reward targets while strictly adhering to risk targets for each trade. Unlike Risk-Off mode, where reward actions do not deviate from trade plan parameters and risk management rules permit exits earlier if existing profits erode significantly, Risk-On mode carries all trades the entire day until the close. This mode is often present during days of momentum which typify the majority of trading days in the first quarter of 2018. 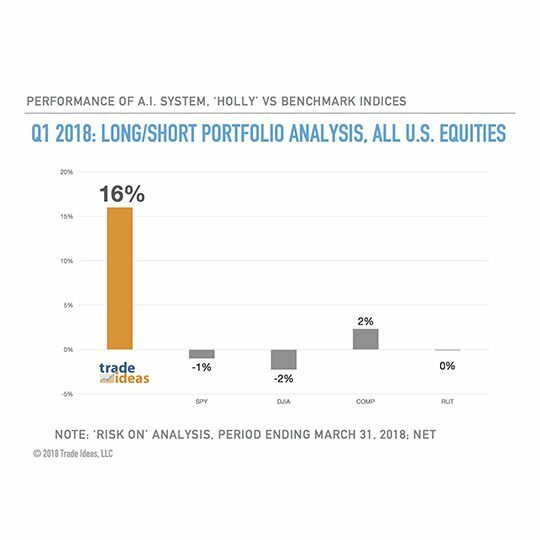 Note that Holly’s Risk-Off performance for Q1 2018 returned a smaller loss of -0.45%.